Situated on the beautiful Atlantic Coast just nine miles north of Boston, the City of Lynn is a wonderful place to buy a home in eastern Massachusetts. Lynn is Essex County’s largest city and the ninth largest municipality in the state. Home to roughly 90,000 residents it is a commercial and urban manufacturing center and part of the inner core of Greater Boston. Well-known for its historic architecture, gorgeous open spaces, remarkable public parks, thriving downtown, and cultural diversity, the city is also home to a long list of intriguing points of interest. 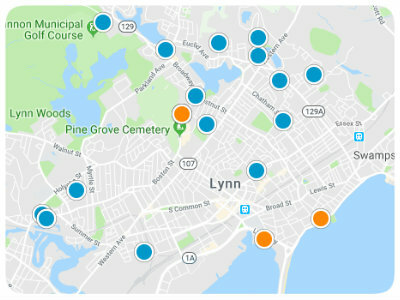 Among the most popular Lynn destination are Gannon Golf Club, Lynn Auditorium, Manning and Fraser Fields, the 2,200-acre Lynn Woods Reservation, Lynn Heritage State Park, High Tower Reservation, the breathtaking oceanfront Lynn Shore Reservation, the Diamond Historic District, and the Wyoma Square neighborhood. This splendid neighborhood is situated at the intersection of Broadway and Parkland Avenue, northwest of the Lynn Flax Pond neighborhood, southeast of the Sluice Pond neighborhood, and east of Lynn Woods. Residents of this densely urban community describe it as extremely walkable, family-friendly, well-maintained, safe, and peaceful. Buying a home in this noteworthy neighborhood affords prospective homebuyers easy access to the many exceptional opportunities for shopping, entertainment, dining, and recreation in Lynn. Wyoma Square real estate is diverse and includes everything from modest two bedroom apartments and studios to spacious three and four bedroom single-family homes. Over sixty-five percent of Wyoma Square properties were constructed prior to 1939 and are historical. Many other Wyoma homes were built between 1940 and 1969. Over forty percent of Wyoma Square properties consist of beautiful large Colonial and Victorian homes which have been converted into apartments, some with as many as four units. You’ll also find corner bodegas and first-floor shops here, along with favorite local restaurants such as Casa Vallarta, Jade Pacific, Rolly's Tavern On the Square, Superior Roast Beef & Seafood, D'Orsi's Bakery & Delicatessen, Walnut Street Coffee Cafe, and Old Tyme Italian Cuisine. With so much to offer the Wyoma Square neighborhood is a must-consider destination for prospective homebuyers interested in available homes in Lynn, Massachusetts. If you would like to learn more about available properties in Wyoma Square, please give us the opportunity to assist you and contact us today.